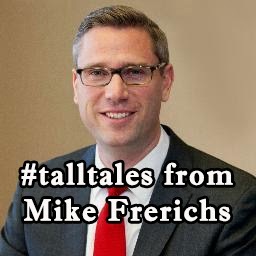 Have you Heard the Mike Frerichs #talltales ? Did you know Mike Frerichs is telling #talltales? With a big 'tip of the cap' to "Chuck Norris Facts" and "The Most Interesting Man in the World", we present some Mike Frerichs #talltales. Do you have any? Tweet them with the #talltales hashtag. You can read the next 25 Mike Frerichs #talltales here. Can you believe these 25 Mike Frerichs #talltales?